More than 40 years of business in the material handling industry has allowed Cyclonaire to serve nearly every industry and market—thereby providing us with the experience to fully understand all pneumatic conveying applications. 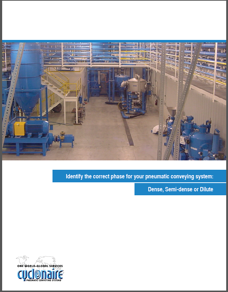 That's why we have developed an informational eBook on the topic: Identify the Correct Phase for Your Pneumatic Conveying System: Dense, Semi-Dense or Dilute. Simply complete the following form to obtain your free copy.